Four years ago I spent five weeks in Botswana with my EIL group on a wonderful program that involved a two-week home-stay in the village of Mmankgodi, travel within the city of Gaborone, and ten days of exploring the Kalahari and the Okavango Delta. During our journey across the Kalahari we spent an afternoon hiking around in the Tsodilo hills enjoying the landscape and looking at rock paintings. Our safari guide told us a little about the “Bushmen” native to the area and the ancient artwork we were standing in front of, but soon we moved on. I did not spend any significant time thinking about the paintings and the native peoples after that. I wish I had stopped to think about the vast and complex history of the land I stood on. At the time, I failed to realize a greater cultural meaning to the area – I had not felt God so I did not think of the spirits of the land. By coming to that spot as a tourist I let myself be limited by my close-minded cultural context and lack of understanding. My tour guide points to Indigenous rock art. I was unaware that I was walking on the land of the San people, who have inhabited Tsodilo Hills for more than 20,000 years. During this time they developed a deep intimacy with the land that provided them life. Traditionally, they live a lifestyle that has little impact on the natural land and they value pacifism and equality, which is extended to humans, animals, and the land. The Tsodilo is made up of four large massifs that stand out in the primarily flat Kalahari. The San believe that these rocks house their ancestral spirits and call them “Male Hill,” “First Wife,” “Female Hill,” and “Child” respectively. The most spiritual site is atop Male Hill, where the first spirit created deep impressions in the rock while kneeling to pray after creating the earth. Thousands of rock paintings cover these sacred rocks – 20,000-year-old imagery that we can still observe today. The painted depictions of animals such as rhinos and giraffes reflect the sacredness of wildlife in their belief system. 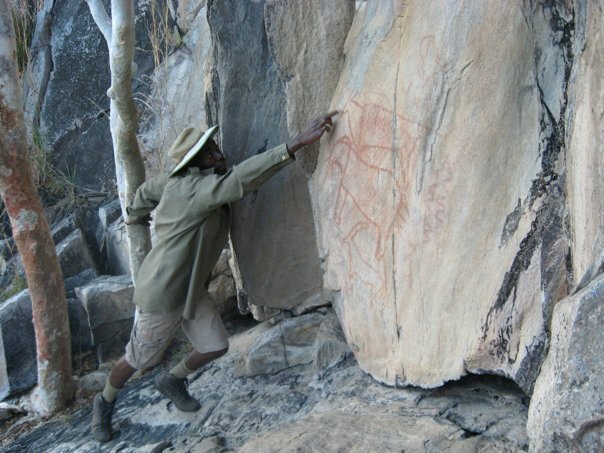 Tsodilo became an UNESCO Word Heritage site in 2001 due to the increasing archaeological and anthropological interest in such ancient culture. 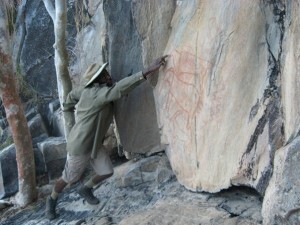 Academics and tourists have become fascinated with the rock paintings, San language, their hunter-gatherer life style, and even their extremely personal ceremonies such as one that involves a shaman entering into a trance through which to communicate with dead relatives and heal the sick. Not surprisingly, the turning point for this culture and the beginning of its destruction occurred upon the arrival of the European colonizers 350 years ago. Many natives were murdered and clans were ripped apart. They could no longer claim ownership of any land under the colonial system, so they were subject to abuse over the use of necessary resources that now happened to be owned by a powerful newcomer. By 2000 most of the San people had been relocated and integrated into European culture by the government. Now, only a small number of San people continue to live the traditional hunter-gatherer life style. They are marginalized in their status as a Botswana minority and have no defense against powerful Tswana government control and the impacts of globalization on their way of life. Conservation areas for tourism and the mineral exploitation of the San native lands are gradually destroying the San way of life and spiritual traditions. Tourists pay government park rangers to guide them through the land that once belonged to the San ancestors. Visitors view 20,000-year-old religious and cultural symbols on rock surfaces and pay the government who is responsible for creating devastating hardship for the descendents of the artists in exchange. The Ju/’hoansi clan is one of the only groups of San people who practice a way of life like that of their ancestors. However, in 1995 they were moved from their ancestral home at the base of the Tsodilo Hills. Their sacred land was taken from them and their options for hunting and raising livestock are now increasingly thin. Though they make the money that they now need to survive through the tourist industry created by their exploitation, what they lost cannot be replaced. Currently, The Ju/’hoansi are fighting for stability and independence through the development of their own health clinic and the building of their own school. A 2006 court case on the government’s eviction of San clans from their sacred lands ruled in favor of the San, declaring the practice “unlawful” and “unconstitutional,” but has proved to have little impact on reality. Consequentially, the San and supporting NGO’s have not stopped fighting for rights to the land that is rightfully theirs. Campaigns against mining and diamond companies are actively working towards the reclaiming of ownership and hunting rights. One proposed solution is the establishment of government-approved land trusts, which gives the government power to oversee the land that is primarily accessed and cared for by the San communities. The government’s eviction practices are defended by their desire to protect the country’s wildlife and integrate the San people into the dominant cultural and economic life. As a consequence of European colonization all over Africa, wildlife is greatly endangered by the over extraction of the earth’s resources. The environment cannot sustain European culture, so the governments designated conservation sites to protect the remaining natural land. On one hand, this bureaucratic action was dire and necessary under the circumstances. However, it is troublesome that the San people fall under these jurisdictions when they have never treated the land with anything but respect and gratitude. The human environmental impact in Southern African cannot be attributed to the San people in any sense. Traditionally, they depended on hunting responsibly for food, but they can no longer hunt in most areas and when they can, their options are scarce. Therefore it says a lot that there are rarely exceptions to conservation legislature for the San communities, yet a large number of mining licenses have been issued for the extraction of valuable resources such as diamonds on reservation land. Since 1997 communities have been relocated outside of the parks onto land that they cannot live off of. They are given goats and cattle as compensation even though these animals have no cultural significance to them. In these relocation settings they are subject to harsh living conditions and racism, which has led to a visible increase in alcoholism, drug abuse, disease and mental illness. Visible to a certain extent; tourism leads visitors away from these harsh realities and puts them in comfortable resorts from which they can vacation and site-see light-heartedly. Tour guides do not explain the displacement and mistreatment of the natives that inhabited the land before the presence of white people. They talk about the ancient history of the rock paintings people so like to see, but leave out the more recent history of the San people. Loss of undeveloped land is not seen as important in Western culture. We tend to think about sacredness in concrete settings such as in an object or a structure. This way of thinking is close-minded and dangerous in a time when the Western world holds so much power. The resulting cultural destruction that we cause based on our lack of understanding of cultural differences is detrimental to cultural diversity and to individuals who live the consequences. Outsiders have a very limited conception of the land in its true sacredness until they really dig deep to respectively understand the San culture. Sarkin, Jeremy and Cook, Amelia. “The human rights of the San (Bushmen) of Botswana the clash of the rights of indigenous communities and their access to water with the rights of the state to environmental conservation and mineral resource exploitation.” The Journal of Transnational Law & Policy. 20(2010): 1-40. “The Bushmen.” Survival International. Survival International, n.d. Web. “Tsodilo Hills.” Sacred Land Film Project. Earth Island Institute. 1999-2012. Web. Tsoroti, Stephen. “Kalahari Bushmen Fight Government Intransience.” World Press 26 Nov. 2007. Web.